I loved the ending… a tasty titbit to make me anticipate the fifth book in the series by MJ Arlidge about Southampton detective Helen Grace. Don’t start reading an MJ Arlidge novel, unless you have nothing to do but read. Because the story moves so fast you won’t want to put it down. 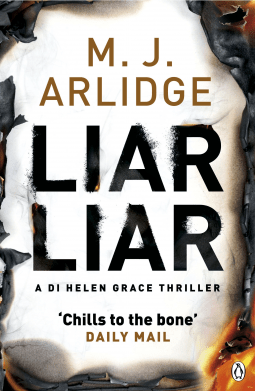 Liar Liar is the fourth in Arlidge’s Helen Grace series set in Southampton, UK. Arlidge is an expert storyteller, he has created two likeable female detectives – DI Helen Grace and DC Charlie Brooks – and put them in a real, gritty, believable setting. The writing is graphic. The theme of this book is fire – there’s an arsonist on the loose in Southampton, setting serial fires – so the description of fire in all its stages and its after effects is at times graphic. Is someone trying to cover up a crime? Could it be a revenge attack on one person disguised by multiple fires? Or is it an insider with a grudge? It is a quick read, 448 pages. Arlidge writes TV drama and his skill at keeping the tension going is clear on every page.